Reaching new heights in Arizona…. It’s been a while since I posted anything…and it’s been another while since I have been out on any trails, especially mountain trails….but here we are again. This particular trail has been on my radar for several months. 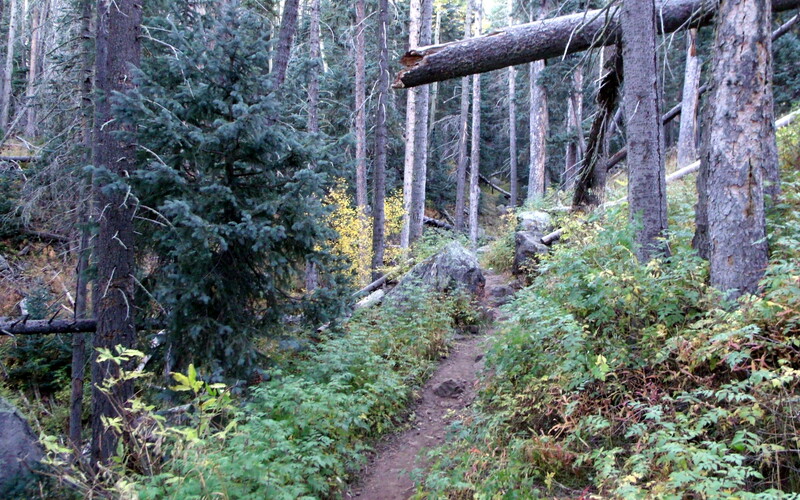 Someone had told me that hiking through the mountains of Flagstaff was very similar to hiking in Utah…the trails and the vegetation were supposed to be very similar…. And I would have to agree…they were very similar…and still very different to my discerning and and probably very biased or prejudiced eye. That spot of blue near the center of the below image was the first person that I saw during my hike…the first of so very many people…..
That aside, it was truly wonderful being back in the chilly mountains, smelling the mulch and other forest smells, feeling the trail and rocks beneath my feet again, and finding comfort and shade from the afternoon sun beneath the pine, fir, and aspen canopy on my way back to the truck. The below image caused me to remember a particular hike that I made with two of my sons in Utah…my younger son and I were telling my older son that “we’re almost there,” and found that we really didn’t know squat about the trail and where we were going…and the substance of the words “false summit” became a reality to us…several times. 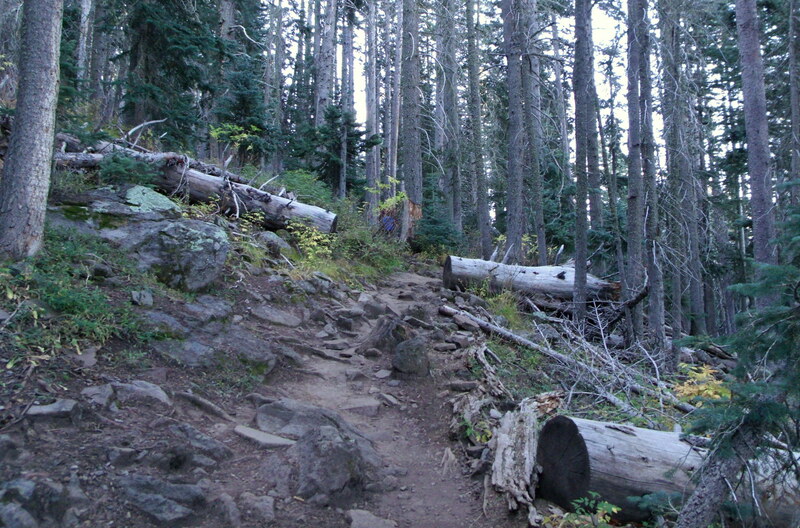 Some passers-by, or fellow hikers on this trail to Humphreys Peak, were talking about false summits and how the “peak” in the below image was nowhere near our destination. You can see another spot of blue just down from the highest point near the center of the image…it’s a smallish person…or maybe a regular-sized person made smallish by the grandness of the surroundings. 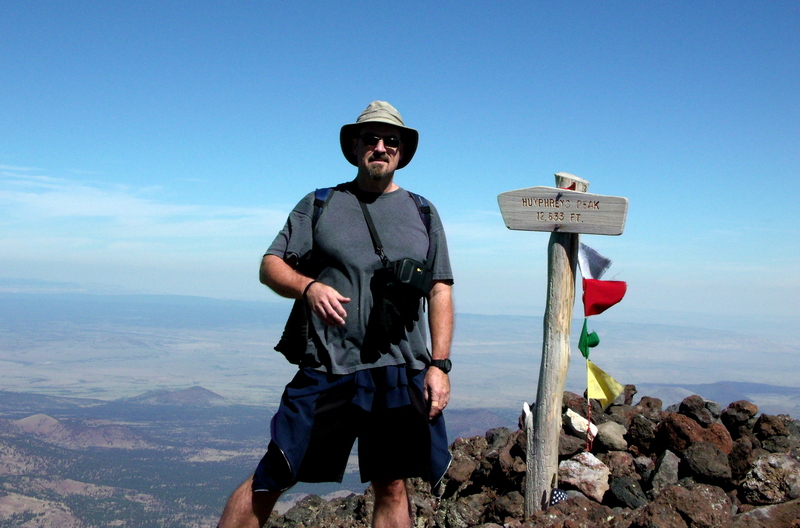 Humphreys Peak (no apostrophe anywhere) is the highest point in the State of Arizona at 12,633 feet in elevation. 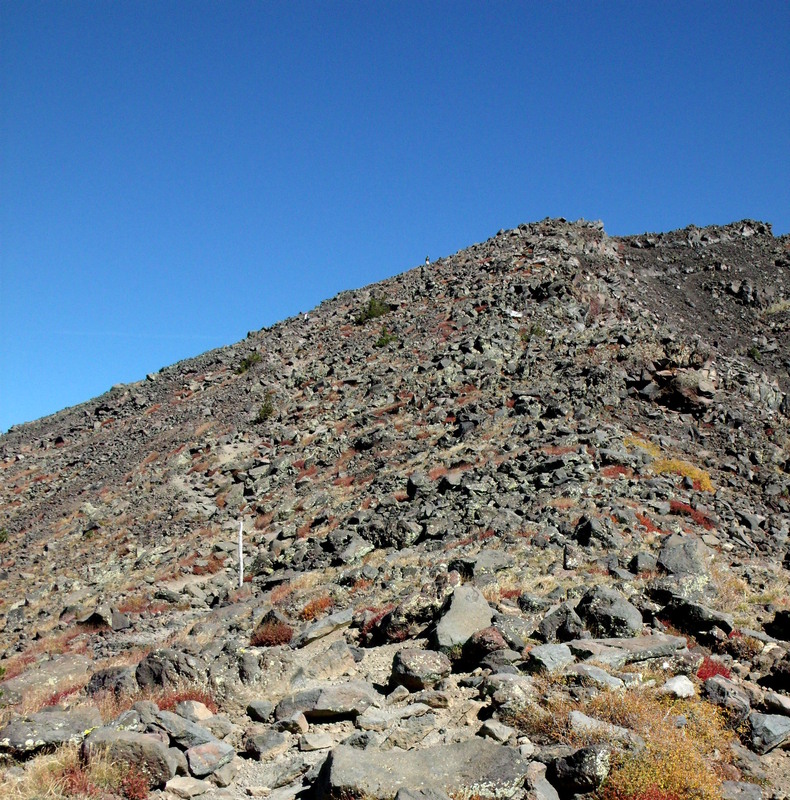 The trail-head is somewhere near 9,300 feet…so it’s a vertical gain of roughly 3,300 feet and takes the hiker 4.8 miles to get there. I made the below image at some open spot along the trail, some little saddle between rises, that allowed a fairly clear view of what things looked like toward the east. 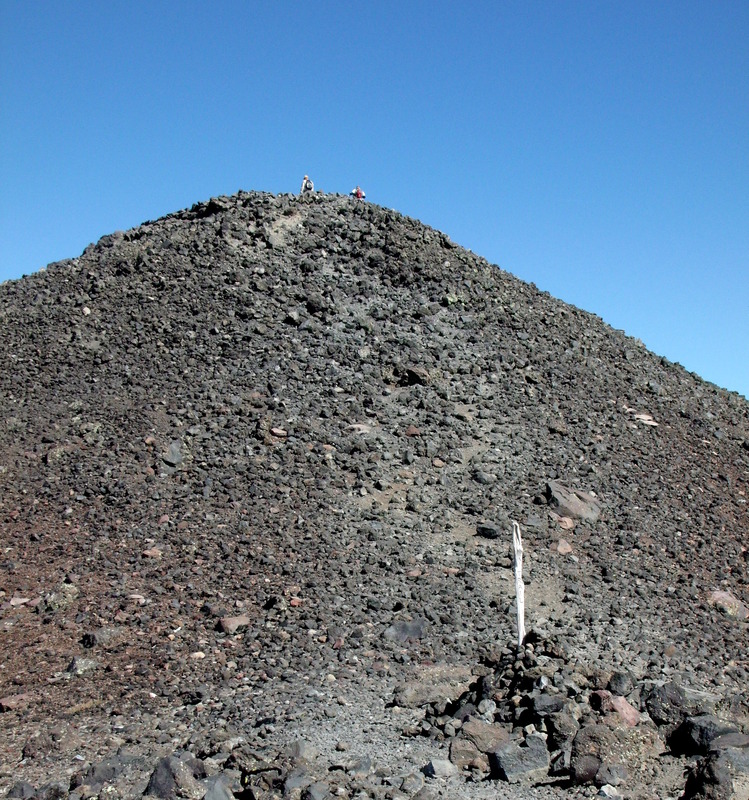 And this is what they looked like when facing north, toward our destination….above the tree-line…along the ridge of what is part of the remaining structure of a massive, extinct volcano that knew its glory-days some 250 million years ago…give or take a millennium or two…or more. 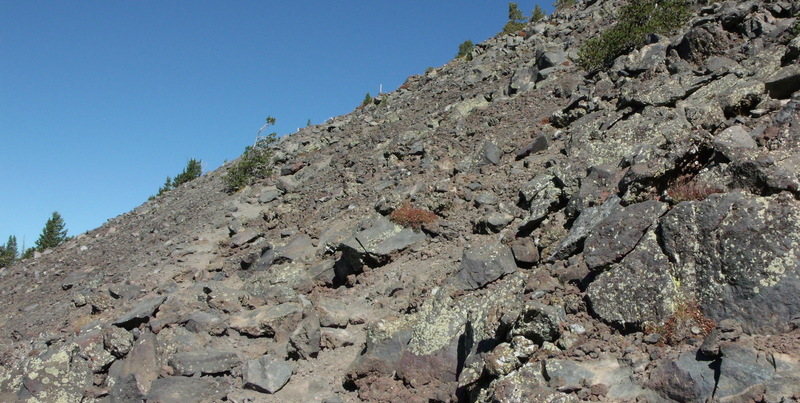 The on-line literature about the trail said that after reaching this point, if you lost sight of the trail, just keep an eye out for the trail markers…which turned-out to be tree branches carved and trimmed and marked with “TRAIL” and jabbed into the rocks along the way. There were places where the trail was not visible, where it really didn’t exist because of the multitude of boulders…places where one could only intuit where it was heading because it was visible again several yards further along. The on-line literature also stated that this is the only “tundra” region in the whole of Arizona…a place where trees do not grow because the climate and soils preclude it. 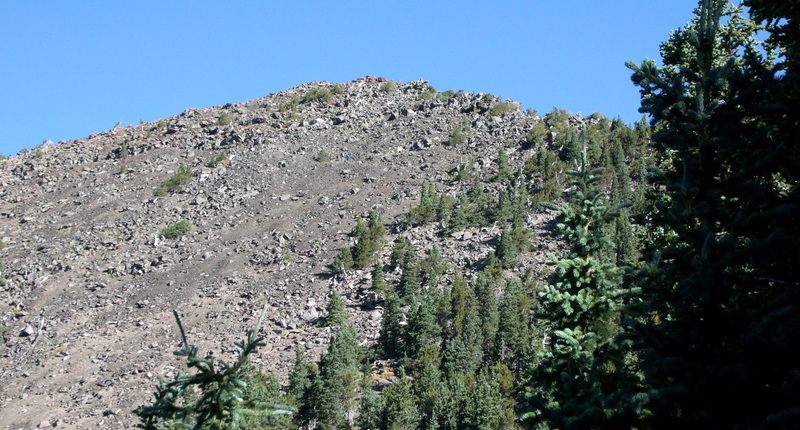 There’s another person in the below image…just right of center on the ridge-line. 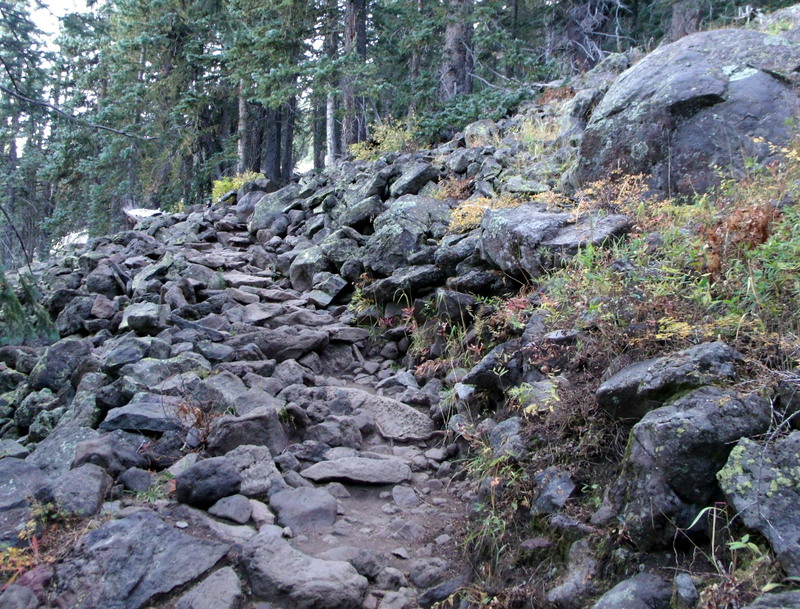 We’re getting closer, but the end of the trail seemed like it was still pretty damn far away in the below photo…. More people below…four or more…. 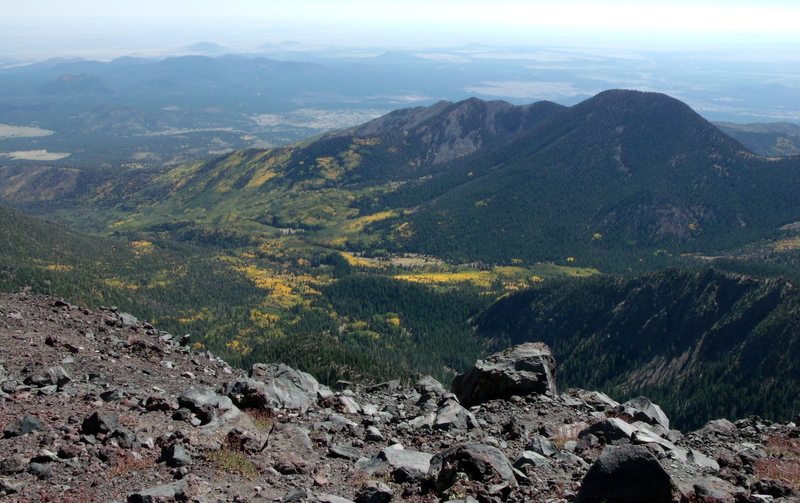 Taking a breather and looking east over the golden aspen before the final climb to the summit…. I joined six or seven other hikers on the peak before another handful arrived. It was very windy…and sweetly cool…it was the perfect setting to enjoy a chilled and crisp apple, a bottle of actually “cold” water, and some granola before feeling crowded to the point of needing to steer my tired self back down the trail. This entry was posted on September 28, 2015 by seekraz. 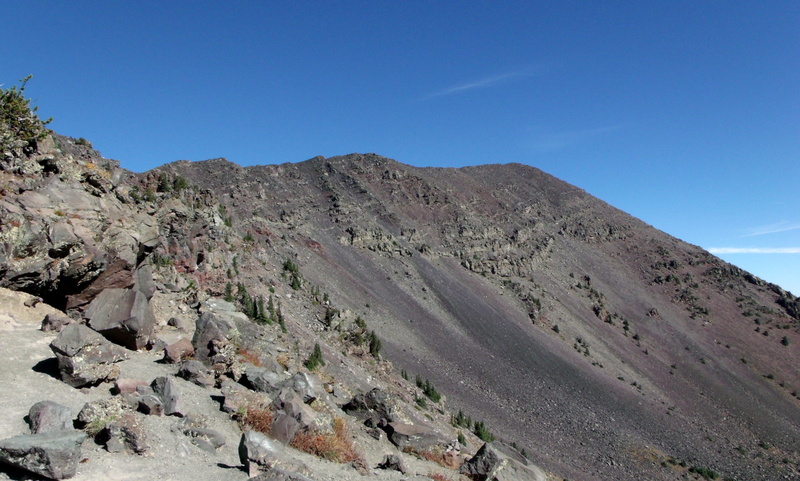 It was filed under Photos - Outdoors and was tagged with Arizona hiking, Flagstaff Arizona, hiking, Humphreys Peak Arizona, images made 9-27-2015, Kachina Peaks Wilderness, photography, San Francisco Peaks, seekraz photography. I thought so, too, Emilio…it was quite wonderful being up there. Wow, what a view…….and you look just a little weary my friend…….and I’m sure I would not have got beyond the trees! I was more than a little tired, John…”weary” sounds about right! Fantastic! Amazing views. 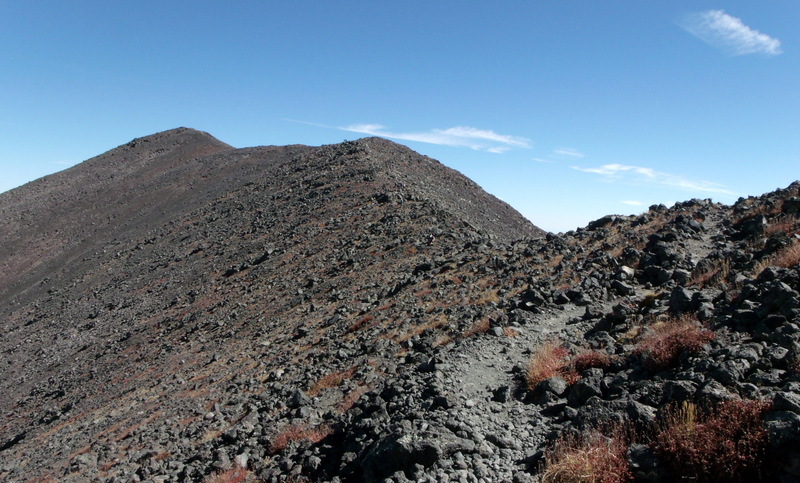 You’re always well rewarded when you put in the effort to make a hike like this one! It was a thrill being up there, Adrian…definitely worth the effort. In one way it is good you saw other hikers. Glad to know the trails are getting the use they deserve. Love the views. Looks like such an amazing day on the trail, the photos are really spectacular. Some hike! I was happy to see those photos because somehow I never got around to going up there. I’m surprised at the number of hikers! And I’m surprised that you never made it there, Terry! The numbers of hikers was beginning to be bothersome, when framed with my desire to be out there for some solitude, but I knew it was a busy trail before I even started, so that was just part of the package. It was still quite an experience….